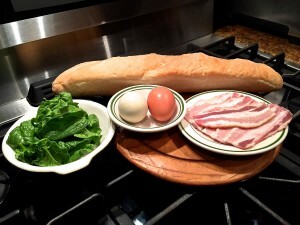 Did You Have a Fresh Farm Breakfast Today? One of the joys of being a regular customer of the Franklin Farmers Market is enjoying a fresh farm breakfast. 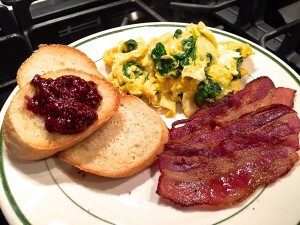 Fresh eggs, local farm bacon, home baked breads, just picked spinach with organic strawberry preserves delivers the best possible farm breakfast to start my day. That’s right! Try it, and you will be amazed at the mouth watering flavor that local Tennessee farm food will deliver. Using all local farm food guarantees more flavor with a high level of nutrition your body deserves! Our market is a producers-only market meaning our farmers and artisans grow it, bake it or make it. 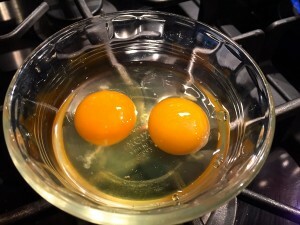 The egg yolks from our local Tennessee farms have a darker yellow to bright orange color from chickens just laid days before, not trucked in from across the country. You never know what shade of eggshell you will find because most local eggs are free range. This means the chickens are eating bugs, grasses, seeds and other natural food they find while they roam free. The just picked spinach will last in your refrigerator for up to three weeks because it’s right off the farm. Our local breads are freshly baked before market. The organic strawberries and other berries you find at market are all from local farms. 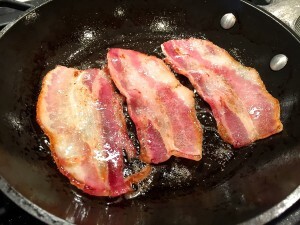 For this farm breakfast, I used local farm eggs from Moonshadow Farm with great tasting bacon from Triple L Ranch. I enjoy my eggs scrambled, so I sautéed some spinach from Norton Family Farm briefly in the bacon grease just before adding my lightly beaten eggs. I don’t over beat my eggs because I enjoy the slight separation of the yellow yolk and egg white after cooking. I then cut off a few slices of French country bread to toast, added some organic strawberry preserves, both from Jones Mill Farm. I’m down to my last jar of strawberry preserves, so this was a special treat. The organic strawberries used in the preserves are from Delvin Farms. Folks, if you want the best tasting breakfast you’ve had in a long time, and I believe you deserve it, visit the Franklin Farmers Market this Saturday and give it a whirl! Just walk thru the market and get you some eggs, spinach or kale, potatoes, bacon, preserves, jams or jellies along with some market fresh baked bread. We guarantee nothing will taste better than a Fresh Farm Breakfast from the Franklin Farmers Market! Come visit our local farmers this Saturday and experience the best tasting local farm food around! This entry was posted in Market Saturday News, Recipes, What's Cooking? on March 20, 2015 .